I don't usually feel like a stranger in my own city. I observe minute changes in the scenery as they occur, and I probably could get around with my eyes closed, that is, if I weren't afraid of walking into a tree or getting hit by a car. Yet there are neighborhoods I don't know very well, and even some where I've never been. Hatikva was one of them. The neighborhood happens to have a great market, and countless restaurants. It also happens to be the Tel Aviv neighborhood with the worst reputation, one of crime and poverty. But not surprisingly, it's not a bad place at all. In fact, it's a pretty decent place. I could think of at least one Tel Aviv neighborhood that is way grosser than the wrongly defamed Hatikva quarter (ahem, central bus station). 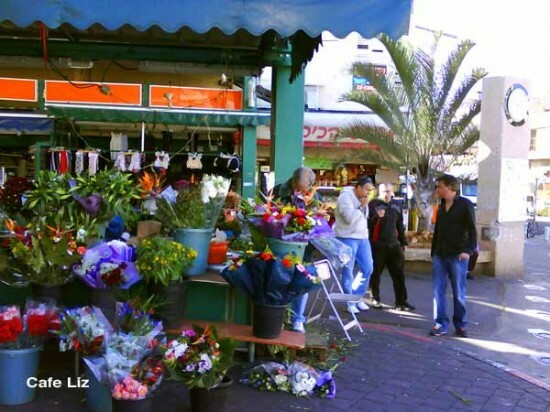 This may be part of the reason that the prices in Hatikva are so reasonable -- to the residents' dismay, the area doesn't have the same draw as yuppified Neve Tzekek, or even the Carmel market and the many Yemenite restaurants nearby. 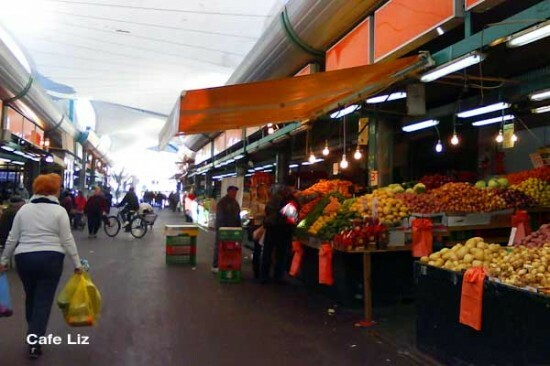 In fact, the Hatikva market is wider and cleaner than Tel Aviv's more popular Carmel market, thanks to a 2005 renovation. Huh. See that guy on the bike? Riding around freely? I bet he could pop a wheelie right there. Remember how you look like an idiot for entering the Carmel market with a bike? In short, I decided to go exploring. It turns out I have a friend who recently moved into an apartment overlooking the market. Why? Because it costs half what it would elsewhere in Tel Aviv. We met up, and started with a quick tour of the market. 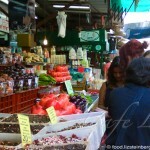 There's one main strip with fruit and vegetable stalls, along Hatikva Street, and while you can find all your basics, I didn't see any of the more unusual varieties that you sometimes get in the Carmel market. I did see a lot of quinces, for some reason, plus strawberries and mini-lemons for half the going rate in the Carmel market. 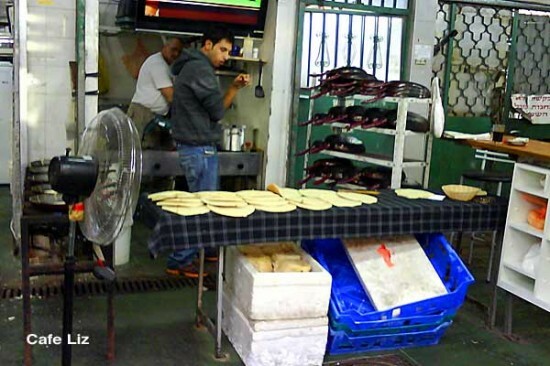 However, more notable than the fresh produce is the prepared food -- the many bakeries, delis and restaurants, run by Jews from all over the Middle East -- Iraqis, Yemenites and Kurds, among others. Right at the entrance to the shook is a Yemenite bakery (Saluf Bakery, Hatikva 1, â˜Ž 03-6886324), and we stopped there first, buying a saluf, a laffah-like baked pita, and a kubana, a round pot-shaped bread. 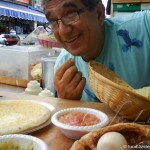 Meanwhile, one of the guys prepared lahoh -- a spongy pancake-like pita cooked in a frying pan. He had about 40 pans lined up behind him, plus a massive plasma TV. "I can make lahoh," I noted to my friend. The shopkeeper overheard me. "No you can't," he responded. What, because I'm not Yemenite? Anyway, the saluf was yeasty and fresh. The kubana was less exciting. On the side streets you'll find lots of butchers. Reportedly, they're all kosher. 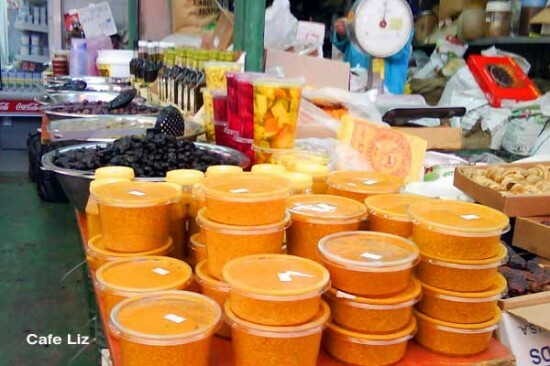 This is the neighborhood to buy amba, the bright yellow sauce featured in Iraqi Jewish cooking. Amba, made from pickled mangoes and spices, including fenugreek, curry and turmeric, apparently was imported to Iraq from India, where amb means mango in Hindi. Here you'll find plenty of people who make their own amba (plus plenty of restaurants using it). While the most well-known shops are Amiga (Nuriel 8, â˜Ž 03-6883689), and Maadanei Ofer (Nuriel 10, â˜Ž 03-6877221), we noticed a few mixed among the fruit and vegetable stalls. There's also Naama (Hamevaser 4, â˜Ž 03-6871073), known for its spices. You can also get sahlev powder and fruit leathers there. The area also has a growing Russian presence, as evidenced by the delis with signs in Russian. One deli had Bukharan breads, which are round and slightly puffy and have a design stamped in the center. Within the market, you'll also find restaurants, including David Habib (Hamevaser 19, â˜Ž 03-6870743), which spans two sides of the street and serves dozens of kinds of kubbeh, meat dumplings coated in starch, such as semolina or rice. 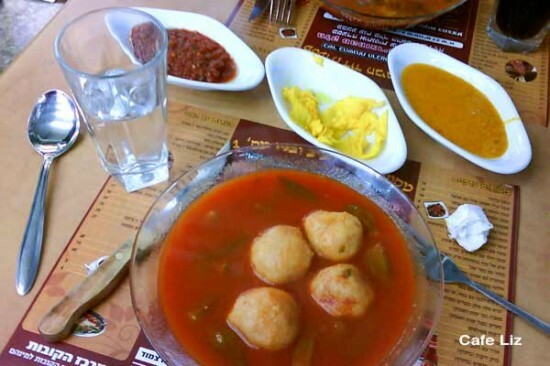 We ordered two of them -- that's my sweet and sour okra kubbeh soup in the photo (27 shekels). For some reason, they gave us some amba as well, even though we didn't order anything that could be eaten with it. Outside, the shook, every other storefront on Ha'etzel street is a home-style restaurant. Shipudei Hatikva (skewers of hope ... how's that for the name, at Ha'etzel 37, â˜Ž 03-6885243) and Busi (Ha'etzel 41, â˜Ž 03-6882041) are set to be included on a "food trail" the neighborhood is planning, but many others looked quite good, too. Such as the kubbeh shop on the corner of Ha'etzel 23. We passed a few spice shops and coffee shops. 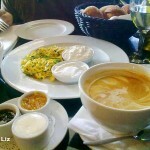 I stopped at Cafe Levy on Ha'etzel 34 (he had decaf beans). There's also Mizrahi's, at Ha'etzel 24, but by the time we passed by, I already had my coffee. There are several nice articles about the market in Hebrew, including one by Ynet, another by NRG and one by Masa Aher. In English, Haaretz recently reported the plans to create "Hatikva trails" highlighting sites in the neighborhood. 6 Responses to "Hatikva market — the other side of Tel Aviv"
My Iraqi ex-mother-in-law makes her own amba. Her family loves it, but the smell of it makes me ill. Some things are an acquired taste, I suppose. Do you have a good (i.e. easy) kubbeh recipe? Thanks Raizy! I’ve never made kubbeh myself, but fellow Israeli blogger Sarah has a few recipes here and here. I think the process is going to be time-consuming no matter which recipe you use, since you have to form all the little dumplings by hand.